Government grievance redressal services are complicated and centralised, putting them out of reach and relevance of citizens in rural areas. They were built to keep ‘middlemen’ out, but end up making it harder for citizens to access grievance redressal and for social workers to help them with the process. 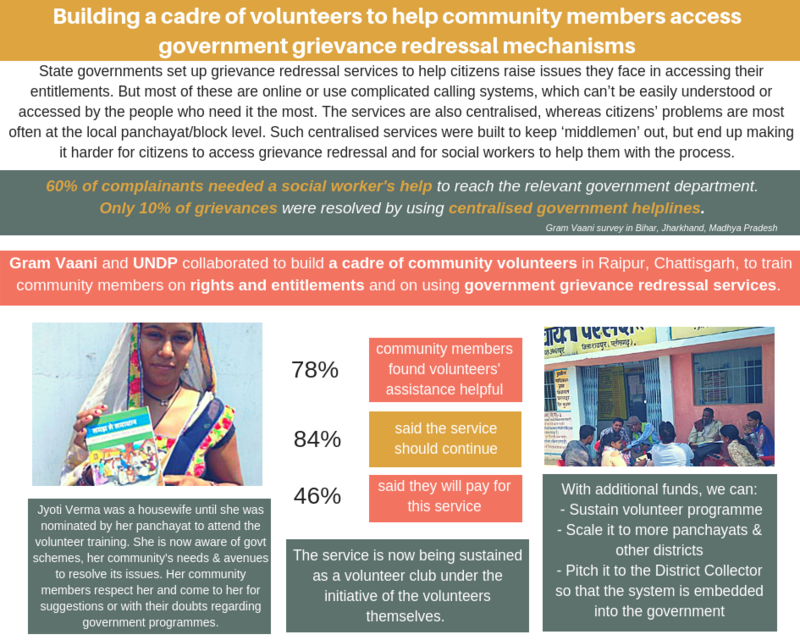 Gram Vaani and UNDP built a cadre of volunteers in Raipur, Chattisgarh, to train community members on rights & entitlements & on using govt grievance redressal services. Our pilot of this replicable model was successful, with 78% of community members finding this useful and 84% wanting it to continue. Volunteers also report how it has earned them respect in the community, given them digital skills and access to employment opportunities. We want to sustain the volunteer programme, scale it to other districts and pitch it to government departments to embed it into their systems. Please write to us at contact@gramvaani.org/ to know more.